Topics: Burglar Alarms, Wireless Alarms, Honeywell, Risco Agility, Visonic Powermax, and Cctv Systems. 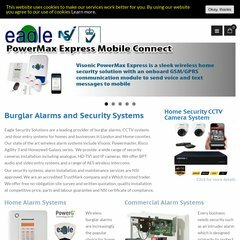 eaglesecuritysolutions.. Wireless House Alarms, Wireless Home Security, Wireless Alarm .. The estimated 421 daily visitors, each view 2.40 pages on average. It is hosted by Fasthosts Internet Limited - Uk S Largest Web Hosting Company (England, Gloucester,) using Apache web server. Its 2 nameservers are ns2.livedns.co.uk, and ns1.livedns.co.uk. Its IP Number is 88.208.252.80. PING www. (88.208.252.80) 56(84) bytes of data. Website load time is 711 milliseconds, slower than 84% of other measured websites. As well, a ping to the server is timed at 131 ms.